The 9/11 memorial owes its elegance to two square spaces -- called voids -- which have flowing waterfalls and reflecting pools. NEW YORK (CNNMoney) -- In December 2003, landscape architect Peter Walker was ready for retirement, but a chance to work on the 9/11 Memorial put the brakes on that. The call came from Michael Arad, who was one of the eight finalists in the World Trade Center Memorial Design Competition that included more than 5,200 entries from 63 nations. Peter Walker helped with the landscaping of the 9/11 Memorial. The 13-member jury, which would ultimately select the winning design, advised Arad that he needed to work with a landscape architect. Arad's austere design, titled "Reflecting Absence," featured two voids -- large square areas -- with fountains and reflecting pools. The square spaces are each a city block in length, and they represent the footprints of where the Twin Towers once stood. Jury members "loved the idea of the big voids," Walker said. "But they really disliked seven acres of stone plaza. The memorial also needed to operate as a public open space. Next to Hong Kong, that neighborhood is probably the densest neighborhood in the world." So Walker envisioned Arad's two waterfall-filled tower footprints embraced by sculptural columns of trees, which would provide scale, texture, variety and a sense of human comfort. And with Arad on board, the jury in January 2004 selected "Reflecting Absence" -- and extended Walker's five-decade career. Walker was a cofounder of the firm Sasaki, Walker and Associates, which was established in 1957. He opened its West Coast office, which became The SWA Group, in 1976. As principal, consulting principal and chairman of the board, he helped to shape The SWA Group as a multidisciplinary office with an international reputation for excellence in environmental design. In 1983, he formed Peter Walker and Partners, now known as PWP Landscape Architecture, in Berkeley, Calif.
Walker has had a significant influence on the field of landscape architecture. He has taught, lectured, written and served as an adviser to numerous public agencies. In 2004, Walker won the ASLA medal, the highest honor that the American Society of Landscape Architects, a trade association, may bestow upon a landscape architect. "Peter Walker is one of the most distinguished landscape architects practicing today," said Nancy Somerville, executive vice president and CEO of the trade group. It is "no surprise that he's the landscape architect for the 9/11 Memorial." 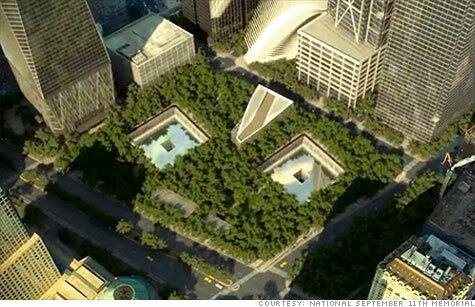 Walker said his vision for the 9/11 Memorial and surrounding plaza, which carried a price tag of around $50 million, was the interworking of three metaphors: If Arad's voids represented loss and sadness, then the flat plane of the design would symbolize the earth, and the trees, a forest of 412 swamp white oaks, life. The trees currently stand about 30 feet high but are expected to grow as high as 60 to 70 feet, providing a solid canopy everywhere except over the voids. "New York is so rough on trees," Walker said. "So much soot in the air and so much radiation that the average tree in New York only lives seven or eight years." Working with a team of consultants, PWP developed an intricate system to address the complex requirements of planting trees within a paved environment. The firm created a soil mix that would be strong enough to support the paving above while still allowing the necessary mix of oxygen and water to reach the roots of the trees. It then developed an irrigation system that would carry air and water to the roots. PWP, a corporation, employs 30 professionals and five staff members, all of whom participate in an Employee Stock Ownership Plan, a benefit plan which makes the employees of the firm owners of stock in the company. "Our capital investment is in our people," Walker said. The company garners just over $6 million in annual revenues. During the recession, Walker reported that revenues continued to remain steady, buoyed by an emphasis on overseas clientele, although profits had decreased. Walker and his team are currently working on building Barangaroo Headland Park in Sydney, Australia, which he said is nearly twice the size of the 9/11 Memorial. "I'm 79, and I'm not sure how long I'll be at this," Walker said. "But if you're doing things you really love, it's a lot easier to get up in the morning. Your bones may ache, but your head is working okay." A tragedy and a windfall: What to do next?